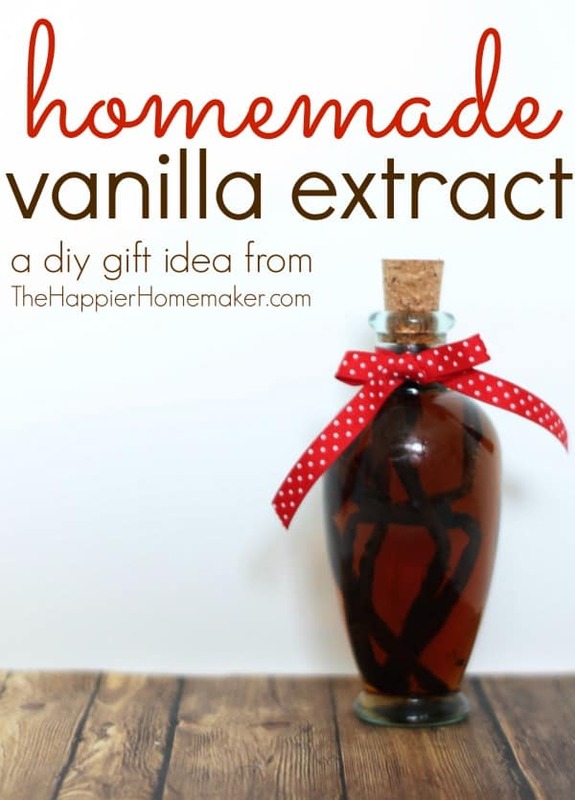 Do you like giving homemade gifts? Like I mentioned yesterday when I shared my Brownie in a Mug DIY Gift, I’m a big fan of making my own gifts and over the years I’ve made some that I love coming back to-this is one of those! 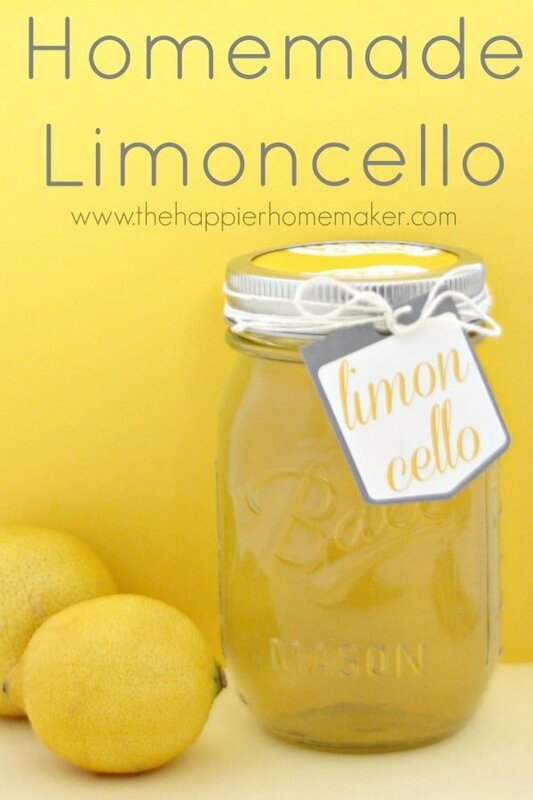 Just like my Homemade Limoncello Recipe, this DIY Peppermint Liqueur Recipe is the perfect DIY gift for the cocktail aficionados on your Christmas list! It’s easy to make, pretty to gift, and affordable! In a small saucepan, combine sugar and cold water. Heat on medium low heat until the sugar is completely dissolved (you should not see any sugar crystals in the water.) Continue to heat for 3 minutes. Remove from heat and allow to cool completely. 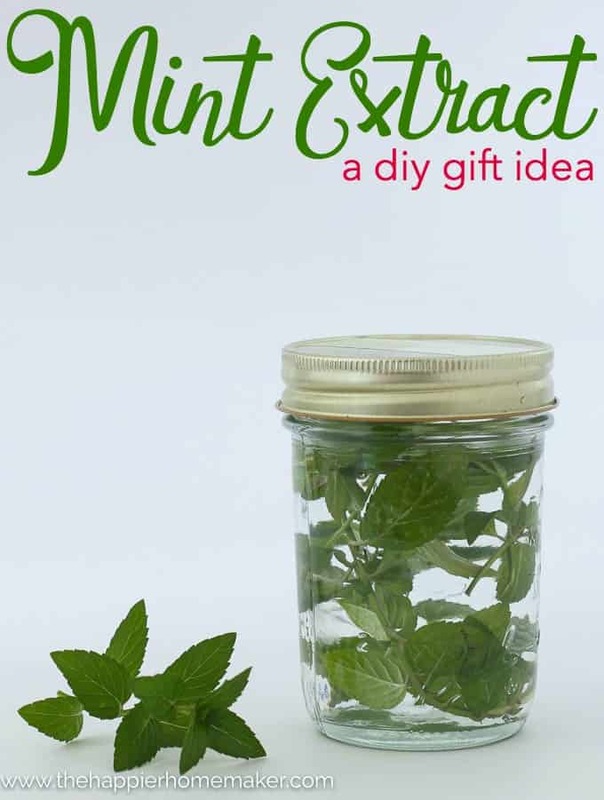 Add vodka and peppermint extract to sugar syrup and store in a airtight container. 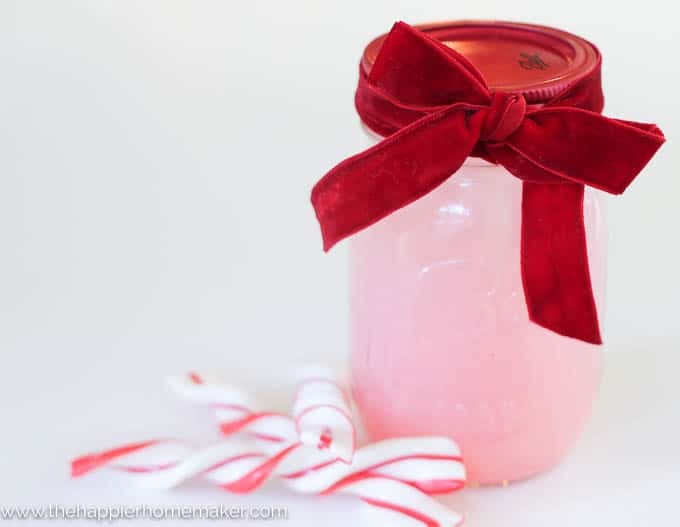 For extra peppermint flavor and color add a candy cane to the mixture and allow to dissolve! 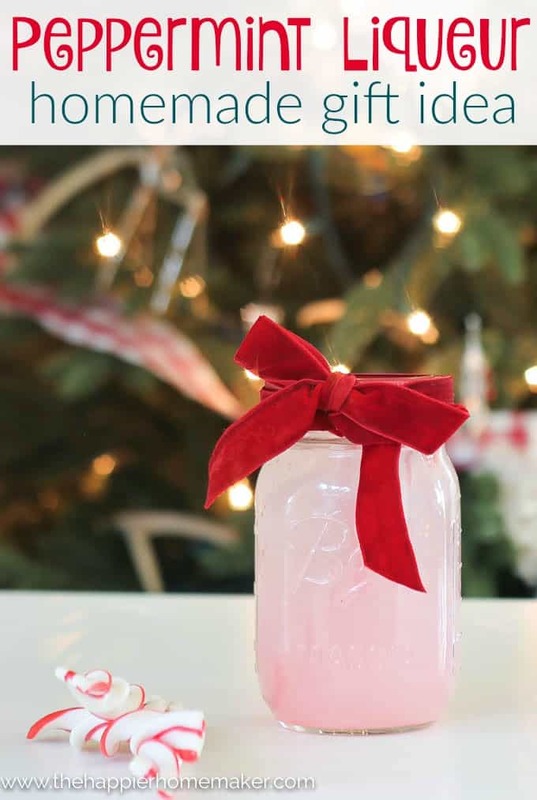 I added these cute peppermint twists I had picked up thinking they would look cute for gifting and I was surprised when they totally dissolved-leaving the liqueur a pretty pink color and tasting delicious! This liqueur tastes delicious added to hot chocolate, coffee, served chilled straight up over ice, or my favorite-added to a bit of seltzer and a twist of lime for a refreshing cocktail! Aren’t those adorable red mason jar lids cute? I love that they offer different color lids nowadays…or have they always and I just found out?? 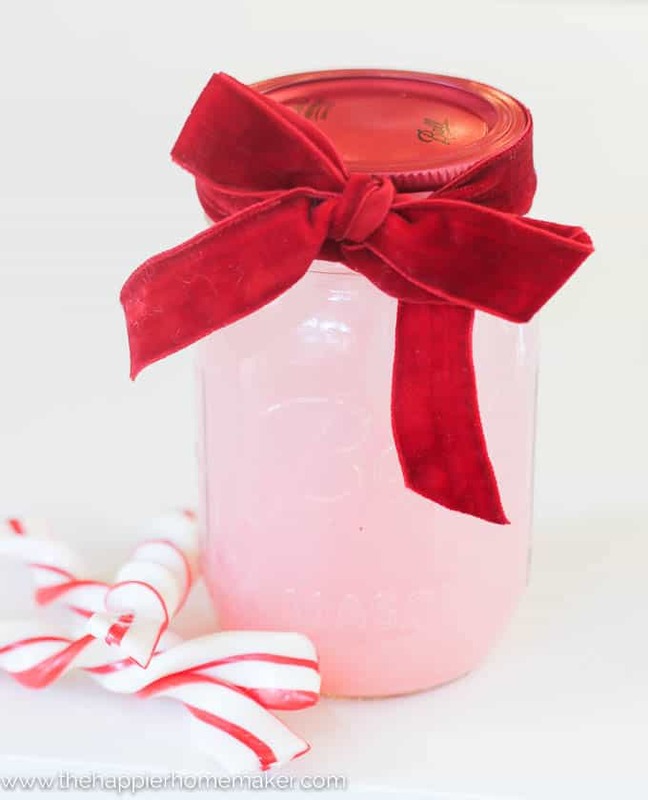 Who would you gift this Homemade Peppermint Liqueur to? Better yet-how would you drink it yourself! ?